Like any other American I have this intense connection to China. Almost everything in my day to day use is “Made in China”! In my mind China was always the place from where all the stuff came from, of martial arts and yes they were commies. Period. But after watching the Chinese New Year Splendor I realized there is more to the country than the “Made in China” label. There are the people – the most important aspect of any country. The show reminds one about the rich culture and tradition of the people. The show presented by NTDTV, going on at the Radio City Music Hall, NYC, is a song dance fare with loads of messages. It is classical Chinese dance. The Orchestra used both western and classical Chinese music instruments (as the host declared more than once). The performance is by the Divine Performing Arts, a U.S. based group. The duration is about two and a half hours with a 10 minute break in between. Apart from the Chinese numbers there were also a Korean and a Mongolian dance. The show did not have elaborate sets and props. It had a screen spanning the background of the stage which showed the required background or animation/motion clips. The whole show was largely carried on the superlative talent of the artists. The special affects included the aforementioned screen, excellent lighting and some stage smoke and fog. If you expected huge dragon and lion marionettes or some fancy acrobatics you would be disappointed. This is just dance and songs. The show was not one single seamless item but a variety of snippets with the curtain coming down after each – which meant after every 10 minutes or so. Then a couple of announcers/hosts would come on stage and detail out the next item in English and Chinese. After that fare, the curtain comes down and they come back with details of the next dance. This was at times a little unwelcome since you could not be completely immersed into the show. Apart from the dances there were also the tenor (twice), contralto (once) and soprano (thrice), a Erhu recital and drummers. Each snippet or number had its own theme or story and sometimes message. They were based on the Buddhist and Confusion myths and legends of the east. The “Sea of Nymphs” was beautiful – with just long flowing blue cloths and a sea background on the screen they managed to transport us to the sea world. “Risen Lotus Flower” was about the Falun Gong, the meditation group persecuted by the Chinese government. Taking on the traditional long flowing sleeves was the number, “water sleeves”. “Fruits of goodness” talked about good deeds not going unnoticed and that eventually one is rewarded for them. “A vanished dream” showed that worldly material pursuit is not enough, spirituality is more important. Some of the others were “Lady in the Moon”, “Lightness and Grace”, “Forsythia in Spring” etc. There were two items with drummers – these were high energy numbers. There was a Korean style dance which it seems required special breathing techniques. The Mongolian routine was called the “Chopstick Zest” with a message that strength lay in unity. It was good. Then came “Power of Awareness” a statement against the oppressive nature of the ‘system’ and how by coming together as one, people can counter these forces and move towards freedom. The principles of Falun Gong were stressed – Truthfulness, Forbearance and Compassion. 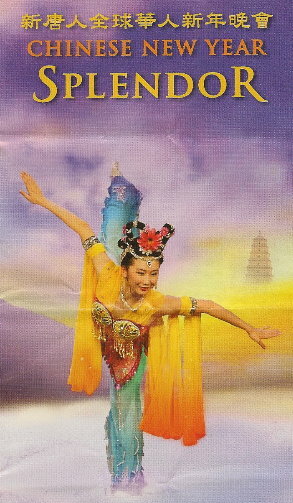 As the host informed us – classical Chinese dance is divided into Bearing, form and Technique. The dances were graceful, rhythmic and coordinated. The costumes were soothing pastel shades but colorful. And the melodious haunting Chinese music complemented by western influence was refreshing. The Erhu (a Chinese musical instrument) recital was excellent. I like the traditional melodious far east, Asian music – it takes me to a contemplative plane every time. Maybe that is why I liked the Erhu. The tenor, contralto and soprano did a good job. I don’t understand Chinese but then there are no barriers in Music. You can enjoy music in any language. The translated verses of the songs were scrolled on the screen. The songs too had a message. The intrinsic message in the entire show seems to be essentially about the people’s spirit wanting to get away from the oppressive and misleading system and how they have hope that one day their dream of freedom and peace will come true. This is what I gathered from the show. Overall the show was very entertaining. A very talented set of artists. But it was a little long and also the curtain coming down after every number prevented the feeling of continuity. If you enjoy classical segment you will like this. But if you are looking for grandiose and large scale shows like those by Cirque du Soleil or the Christmas Spectacular you could be disappointed. Photography is not allowed during the show. Directions to radio City – follow the link. Tickets available from Box Office and Ticketmaster. My daughter and I went to see the Chinese New Year Splendor show in Chicago last year, and we thought that it was just great – – really beautiful. My daughter has been studying Chinese language and literature, and it was as though the Chinese dynasties were right up there on stage! The costumes, music, even the scenery are authentic to their region and time period. This year we saw it again, and many of our friends went to see it as well. Everyone loved it. The Chinese Splendor show mentioned truthfulness – compassion- tolerance . As a mother of 5 children, these are all qualities that I emphasize to my kids. Wouldn’t this world be a much better place if we all tried to handle each other with compassion and tolerance? I hope that this show tours next year – I definitely plan to see it! Next PostNext I don’t have to pay for using the restrooms here!